Bentonite Clay, Silica Gel, Molecular Sieve. Clariant’s Desi Pak bentonite clay desiccants are an effective and economical desiccant option. A calcium-rich montmorillonite, Desi Pak’s layered structure attracts and binds water molecules to its vast inner and outer surface area. Even at full water vapor capacity, Desi Pak remains dry and free-flowing with no apparent change in size, shape or texture. The adsorption capacity of Desi Pak is considerable even at low humidity levels and increases as relative humidity rises. Desi Pak’s adsorption rate is high enough to prove effective for most applications at low humidity. At high humidity levels, Desi Pak adsorbs moisture much more slowly than silica gel or molecular sieve, making handling less problematic. Desi Pak’s adsorption capacity as a function of temperature remains constant at constant relative humidity between 20°C and 50°C (however the rate may vary). Desi Pak products can be reactivated for multiple uses. 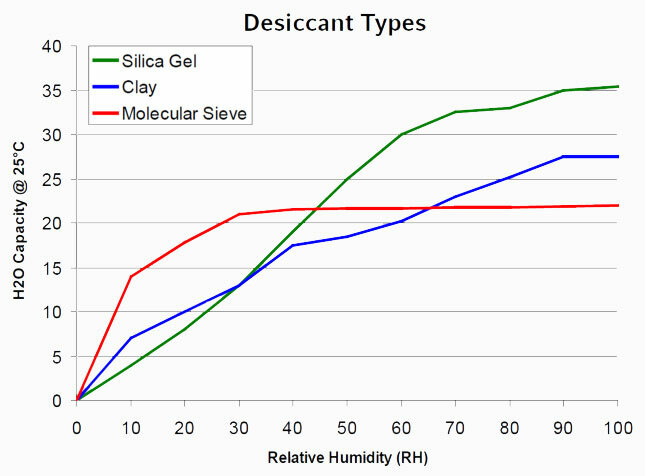 Tri-Sorb molecular sieve desiccants are the most aggressive of Clariant’s desiccant options. Based on the synthetic zeolite (molecular sieve) types 3A, 4A and 13X, these zeolites exhibit crystalline structures with well-defined and uniform pores of 3Å, 4Å and 10Å diameters respectively. Tri-Sorb adsorbs water vapor and gas molecules that fit into the pores. The adsorption capacity of Tri-Sorb is relatively high at low humidity levels and remains almost constant as relative humidity increases. The adsorption rate is also high at high humidity levels, where Tri-Sorb accepts moisture much faster than Desi Pak, making handling more difficult. The adsorption capacity of Tri-Sorb as a function of temperature remains constant at constant relative humidity and absolute humidity between 20°C and 50°C (however the rate may vary). Clariant’s Sorb-It desiccants are made of highly porous amorphous silicon dioxide. Sorb-It binds water molecules in random intersection channels of various diameters and remains dry and free flowing, even after fully saturated with water vapor. Sorb-It’s adsorption capacity is relatively small at low humidity levels but increases as humidity rises. At high humidity levels, Sorb-It adsorbs moisture faster than desiccant clay. Sorb-It products can be reactivated for multiple uses. sealed packages with limited MVTR. Traps moisture into thick, no-spill gel.